This article could equally well be called, “How to prevent your competitors from stealing your clients.” It’s not that other lawyers lack ethics, values and courtesy, it’s just that as practices diminish, revenues have to be obtained somewhere to support the firm and its employees. The bottom line is that others may have your clients in their cross-hairs. Over-communicate with your clients. This means, for example, learning about their businesses and their personal lives in some depth, managing their expectations, quoting fees or special fee arrangements, keeping them up to date so they never have to wonder about the status of their matters. Project effort. This means opening the curtain that conceals what you’re actually doing for your clients. (Lawyers don’t intentionally conceal their work: what they are doing just seems so natural to them that they don’t see the point in telling the clients all the steps involved.) On highly complex matters, give clients a one-page executive briefing that lays out the nature of the steps that are involved, and tell them you will report if their matter varies from this protocol. Master the art of imperfection. You were likely so bullied in law school and by the lawyers with whom you practiced in your early career that you think you must have the right answer or somehow you are not worthy. The truth is that your job is to know how to find the answer or to make a great guess … not to always be right. So when your client asks a question you don’t know the answer to, confess that you need to do some more digging; perhaps even admit the fallibility of your recommendation. Treat your colleagues and staff with exemplary respect. It is not charming or humorous when you put each other down, especially a member of the support team. This is the way insecure and cowardly people act, and is not the impression you want to give. On the contrary, showing profound respect for your colleagues and team will enhance the confidence your client has both in you and in those with whom you work. Let your clients know that you think about them between matters. 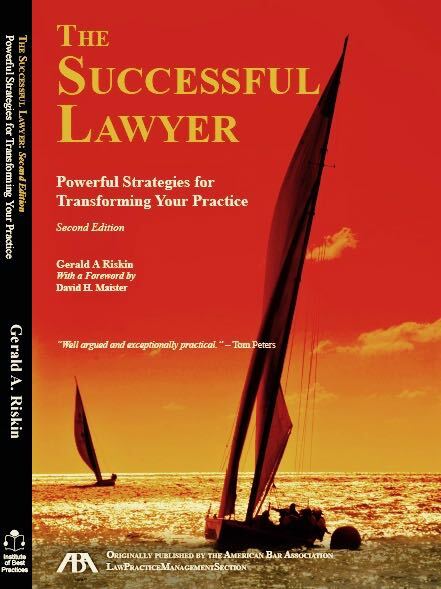 I have it on good authority (first-hand research) that clients think that lawyers are reasonably attentive during the course of an ongoing matter, but that they forget that their clients exist between matters. Set up a Google Alert or some other means of watching the progress of your clients, whether individual or business. Congratulate them on achievements or express concerns about setbacks. You might even remember personal occasions if appropriate. Distinguish yourself from the stereotype of lawyers: make it clear that you care about your clients beyond the revenue you generate from them. Manage your practice. A disdain for technology and efficiency is not charming at all anymore. Your clients expect and deserve prompt and efficient service and as mentioned in Point 3, above, they expect to see evidence of it. Relationships are still extremely important but not sufficient to overcome unreliable service. There are still some lawyers who suffer from the self-deception that quality speaks for itself. It does not. It must be projected. Worse, slow or unreliable communications imply terrible quality. I welcome your feedback regarding client retention or any other matter, either through the comments section below or directly, via my email. * Edge International Communique is published once each month and features articles by Edge International partners from around the world on a variety of issues relating to law-office management and governance. You can subscribe to EIC here.